The Salt River Canyon Wilderness is located within the Tonto National Forest. The Wilderness area was established in 1984 and covers 32,100 acres of land. The main boundaries are Highway 288 on the west side and the bridge over Highway 60 to the east. There are approximately 52 river miles within the Wilderness. Elevations range from 2,200 feet to 4,200 feet. There are only three access points within the Tonto National Forest which are Gleason Flat via Seven Mile Wash off Highway 60, Horseshoe Bend and Redmond flat via Highway 88 from Globe. The terrain is very rugged with steep mountains, cliffs, and spine ridge tops. Vegetation within the area is typical Sonoran Desert with plants such as various cactus, ocotillo, palo verde, and creosote bushes. The upper elevations offer oak, manzanita, and juniper. This area receives a good amount of rain throughout most seasons so vegetation is lush and healthy. Activities within the Wilderness area typically consist of white water river rafting and fishing, however some very rewarding cross-country hiking opportunities do exist for those that are a little on the ambitious side. No maintained trails exist within the wilderness area. 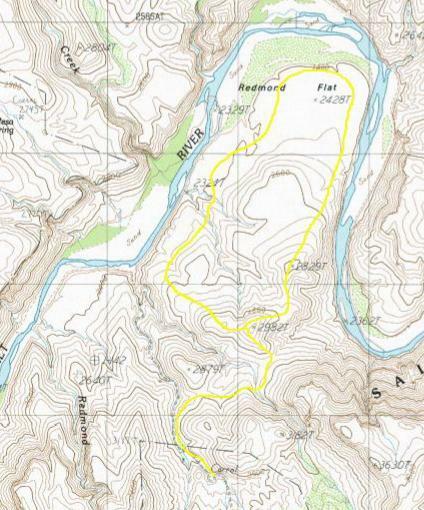 The area that I prefer to hike is a small inner basin south of "Redmond Flat" which is just downstream from a more widely known access called "Horseshoe Bend". 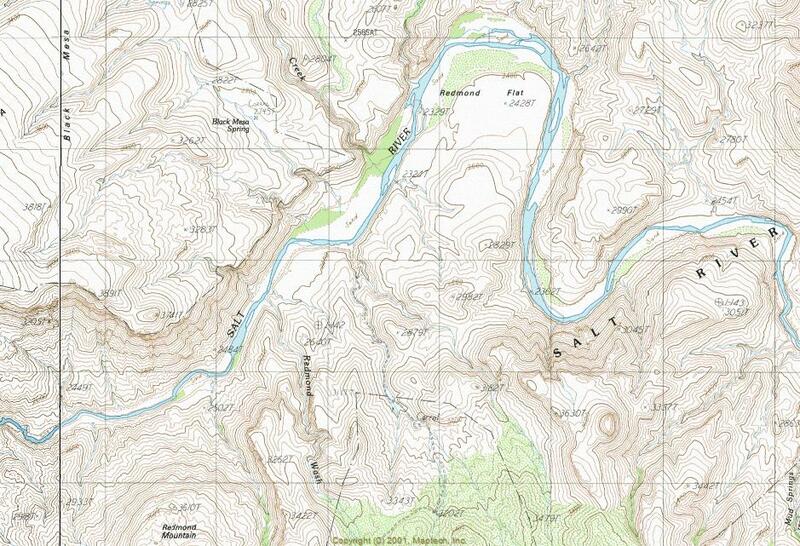 Both of these locations are noted on topo maps. This portion of the Salt River Canyon Wilderness is rarely visited and offers excellent solitude. The road that enters this area reaches the Wilderness boundry from a sand wash. The boundry line is near a corral and approximately one mile from the river. The terrain surrounding the basin is steep and rugged but if you work the ridges and saddles you can reach some truly amazing vistas. Hiking the river itself is also very rewarding in the winter months when the flow rates are low and the water is clear. The topo maps for this area are "Dagger Peak", "Rockinstraw Mountain", "Salt River Peak", and "Meddler Wash"
The route I chose for this particular trip was in September and relatively short due to rising temperatures. I started out at 6:00 AM with the morning temp. surprisingly only about 70 degrees. I was not anticipating an enjoyable hike for this trip. What started out in my head as a questionable trip turned out to be a great day. The temperatures were mild throughout the morning and did not begin to become uncomfortable till after 10:30 AM. Hiking this area in September after all of the monsoon storms offers some very rewarding photography because vegetation is so rich and green. This area is unspoiled and truly beautiful. My hike was a 6 3/4 mile lasso loop. I hiked into the mountains northeast of the corral and worked my way along a ridge above the river and eventually out on to Redmond Flat. The Salt River was still somewhat swollen and muddy from summer monsoon storms. I wrapped up the hike around 11:30. Hiking in the Salt River Canyon Wilderness consists of rugged cross-country bushwhacking, canyoneering, and sand washes. The best time of year for hiking in this area is in the winter months. This is a very special, lightly used area that is only about 1.50 hours from Mesa, AZ. Typically the words "solitude" and "close to town" could never be used in the same sentence but that is the best description for the Salt River Canyon Wilderness. The route is yours to choose with the unknown being part of the adventure. From Mesa Arizona take Highway US 60 to Miami. Turn left at Highway 188 to Roosevelt Lake. Travel 4.5 miles north. The first 4.5 miles of highway 188 have two northbound lanes and two southbound lanes. Stay in the right lane while traveling north. The right lane ends at Wheatfield's Road, which is where you will be exiting. Travel northwest on Wheatfield's Road while paralleling highway 188 for 1.7 miles through a residential area. At 1.7 miles there is an abandoned slump-block building. Turn right at the slump-block building onto Hicks Road, which will soon go over a bridge crossing Pinal Creek. Pinal Creek is a wide sand wash. Once across the bridge, travel northwest on Hicks Road paralleling Pinal Creek for 2.3 miles to FR219 (Lat. 33 degrees, 31', 24.10", N / Long. 110 degrees, 51', 45.60", W). Just before reaching FR219 you will drive past a large well kept ranch on your left. At the beginning of FR219 there is a gate with a "Private Land Access Sign-In Book". FR219 is in a large sand wash. You will be driving through private land for about 1 mile. The private land ends at a cattle guard in the sand wash. Drive Northeast on FR219 from the gate for approximately 5.5 miles to FR223. The sign will say "Shute Spring". Drive Northwest on FR223 for approximately 2.5 miles. At that point you will reach a fork where FR223 turns Southwest to Shute Spring. Do not turn left. Continue going strait. You are now driving on FR644, which leads to the Salt River Canyon Wilderness boundary. You will reach the boundary in approximately 4.5 miles. Prior to May 08, FR644 accessing the Wilderness boundary was almost impassable. Due to some elaborate work by the local rancher the road is now in good condition, however that could change over time. 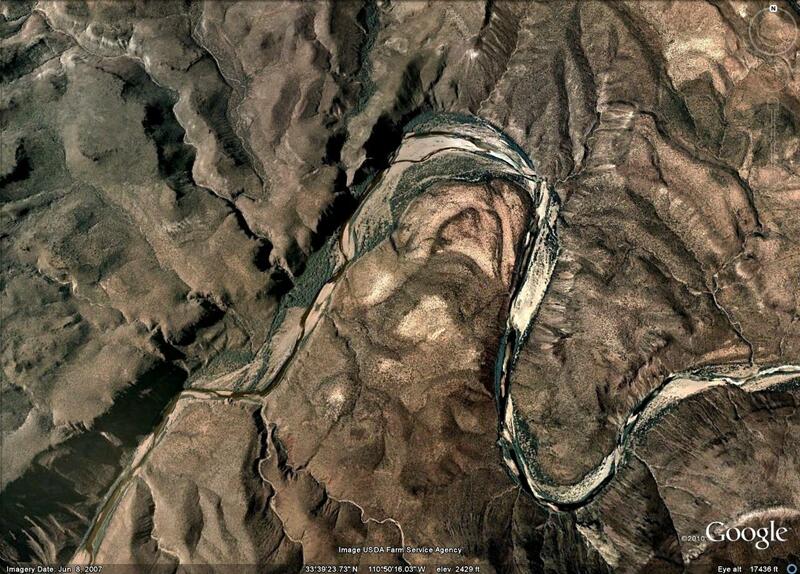 The last portion of FR644 heading into the inner basin is steep, consists of loose gravel, and erodes very easily. Accessing this location should only be done with a 4x4 vehicle.